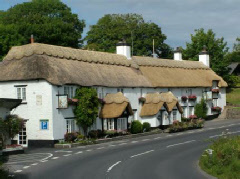 Offering fourteen guest rooms, the origins of the thatched Hoops Inn are said to date as far back as the 13th century. If true, this makes the building one of the oldest offering accommodation in the south west of England. Whether the likes of Sir Richard Grenville and Sir Francis Drake used it as a meeting place, as some say, is unknown. However, one can forgive a little romanticism and it would be unfair to dismiss the notion out of hand. Those who prefer period surroundings will no doubt opt for the rooms to be found within the main building itself rather than the converted coach house. Of these, the Mallow Suite is perhaps the most notable, being set over two levels complete with four poster bed and some original architectural detail.